A robot named Amazing Quick Floor might sound like a new rival to Roomba. Trust me, it’s not. Quick Floor’s real rivals include The Airnator from Germany, capable of whisking milk into speed (technical details: unclear) and Hong Kong’s fearsome The Peanut Giver (main weapon: peanut flail; secondary weapon: generously donating peanuts to its adversaries). These robots, and many, many more, are part of Hebocon, a Japanese competition for compellingly crappy robots. Since 2014 Hebocon has spread across the globe at breakneck speed — in part because it would take anyone, including you, about five minutes to get started on their own Hebocon competition and/or robot. A good starting point for the story of Hebocon is its founder, Daiju Ishikawa, standing on something that stretches the definition of a stage during the inaugural event. There’s a faint, satisfied smile playing on his lips, and the room is buzzing with competitors, holding their…curious…robot creations. The main reason is likely the robots themselves. Amazing Quick Floor, literally a piece of cardboard paper stuck to two automatic cars, is charging across the ring at its opponent, a beetle-like robot that’s actually an iPhone cover mounted on a pair of wheels. It slowly drives over the advancing Amazing Quick Floor, which continues its bulrush straight out of the ring. One of the next battles sees a dark horse emerge, in the form of a box of tissues, propelled forward on six mechanical…instruments of pleasure. It fails to advance in a four-robot free-for-all. “Luckily, it got eliminated, because otherwise we might never have gotten media coverage,” Ishikawa says with a laugh. Recounting who won the initial event would be beside the point. “Heboi” can be translated as “poor in quality/ability” or simply as “crappy.” The con stands for contest. Put it together, and you get a contest for crappy robots. Incidentally, it’s also a play on words, as Japan’s biggest, most famous robot contest is called Robocon. 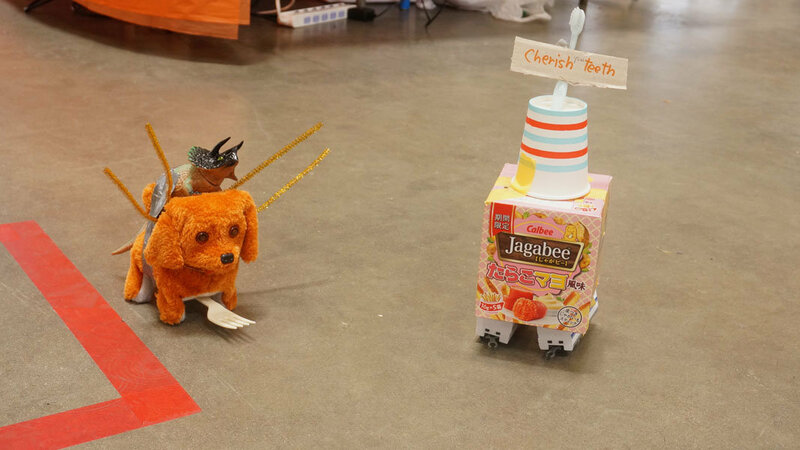 The initial idea for the competition came from Ishikawa wanting to celebrate some of the less than successful products that didn’t quite make it to Tokyo Maker Faire 2013. That led to thinking about how building complicated, technical products like robots is both stressful and frustrating. Building a crappy robot, on the other hand, and then having it fight other equally, fantastically, horribly designed robots, is not. Disregarding anything remotely related to product testing, the competitions become a surprise for everyone involved. “Many times the robots do things different than you think. For example, one participant built a plastic propeller bird, but when he turned on the propellers at the start of the match, it went backwards straight out of the ring, instead of forwards,” Ishikawa says. Winning is frowned upon, while losing — or not even trying — is celebrated. That doesn’t just apply to the robots. At the initial event, one entrant forgot her robot on the train and decided to go drink beer instead of actually going to the contest. She tweeted a picture of her beer to the event organizers, who put it up on the main screen. The level of “hebo” she had displayed was widely lauded and applauded. Back to 2014, and the first Hebocon event is a wrap. The whole thing is filmed, and the video is submitted to the Japan Media Art Festival, where it is praised (perhaps, in part, thanks to the elimination of the “pleasure-bot”). It is also uploaded onto YouTube where Hebocon quickly goes viral (perhaps, in part, thanks to said bot). Questions flood in about where the next Hebocon event will take place and how to take part. Fast-forward four years, during which Ishikawa and his Hebocon collaborator Chikako Koga bash keyboards, answer questions, arrange events, build robots. And laugh. A lot. By 2017, there have been 130 Hebocon competitions in over 25 countries, including the first World Championship, held last year in Tokyo. The concept has proven very popular with Maker Faires, and Hebocon will be part of the upcoming San Francisco Maker Faire in May. Usually, the robots are limited to 50 centimeters, but Ishikawa and Koga fondly remember the first, and so far only, Giga-Hebocon event where robots were up to three meters tall. “Many contestants were riding their robots. There was a battle where a robot driven by someone’s granddaughter drove straight through a three-meter tall Gundam robot. Well, it was huge paper printout of a Gundam robot that had drones attached to its knees and elbows, and held upright by two fishing rods,” Koga explains. “We try out maybe three or four ideas on the site every day. Some of them turn out good. Others not so good. It is about letting them live freely and seeing where they lead to,” Chikako Koga explains. Both Koga and Ishikawa have been fascinated by the response from many Westerners, who often insist on trying to explore the ideas and concepts behind Hebocon. “It has been very interesting. Our starting point was that it was very simply about having fun. The global foreign standpoint has been that it was fun, yes, but that Hebocon is also about exploring creativity and making things. I am very happy about it, because it has led us to look at how Hebocon can work with education and how children can learn through building and interacting with the robots,” Ishikawa says. Make up for technical incompetence with strategy. Do not let your guard down until the match is on. Shame on you, winner; be proud, loser. Praise the Heboiness of others. Anyone interested in attending or arranging a Hebocon event should start by contacting Hebocon through the official Facebook page. Ishikawa, Koga and co. will then send you documents, including the official rulebook, a guide to organizing a Hebocon event, logo files, etc. That’s more or less it. Try combinations that you would never do at work, like making a propeller with dried squid rather than plastic or metal. Avoid technology that you’re familiar with. Do not use a soldering iron or other tools. Make it with your left hand (if you are right-handed). Make it with your feet. Leave the most important part to a five-year-old child to make it for you. Marc is British, Danish, Geekish, Bookish, Sportish, and loves anything in the world that goes 'booiingg'. He is a freelance journalist and researcher living in Tokyo and writes about all things science and tech. Follow Marc on Twitter (@wokattack1).